Many people feel more comfortable with someone else helping them with their finances. A common piece of advice these days is to find a fee-only advisor that doesn’t work on commission. Many times this leads to a recommendation of the National Association of Personal Financial Advisors (NAPFA), whose members must promise to be fee-only and act in a fiduciary manner (putting your interests first). They are regularly mentioned in Kiplinger’s magazine, and I’ve even referred a few readers to their website myself. You’d think that putting your money with the president of NAPFA would be a sound idea, right? The National Association of Personal Financial Advisors (NAPFA) will happily refer you to a fee-only advisor. Despite their lofty mission, no fewer than two of its recent presidents have been investigated for kickback schemes (one for defrauding clients by secretly putting $47.5 million of client money in a start-up he founded). Several years ago, I referred someone who was looking for an advisor to this group. When I followed up to ask how it went, he said, “The guy they sent me to tried to sell me a variable annuity.” This is exactly what fee-only advisors are not supposed to do: push high-margin commissioned products. This organization is a useful idea and I wish I could endorse it, but the execution leaves something to be desired. It is important remember the relatively loose relationship between NAPFA and its members. There are many reputable, honest fee-only financial advisors out there that are members of NAPFA. BUT, you can’t solely rely on NAPFA membership to mean that the person you pluck out of their directory will be reputable and fee-only. It’s not very difficult to become a member, so unscrupulous people can join to get that layer of credibility and then abuse it. Educate and protect yourself. NAPFA is a trade organization, so it mostly about marketing and getting good publicity. There’s nothing wrong with that, but as a potential client there is much more due diligence to be done before settling on an advisor. Make sure your money is kept at a well-known third-party custodian such as Schwab, Fidelity, or TD Ameritrade. Know what products are often sold by commission. Use the helpful resources at this SEC.gov broker check page. 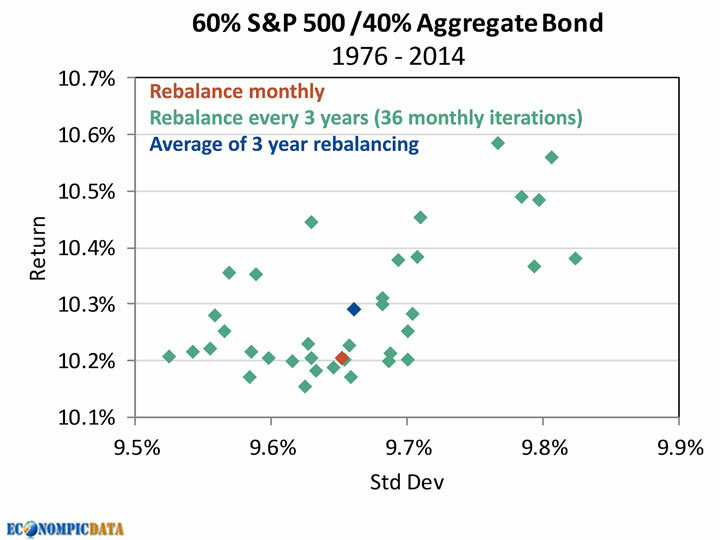 Portfolio Rebalancing Frequency: Even Less Than Annually? Momentum is cited as a potential reason why this works. Looks good at a glance, but look at that y-axis. We are comparing 10.3% and 10.2%. Is that really significant? We found that no one approach produced significantly superior results over another. However, all strategies resulted in more favorable risk-adjusted portfolio returns when compared with returns for portfolios that were never rebalanced. Aside from avoiding excessive trading, there are no optimal rebalancing rules that will yield the highest returns on all portfolios and in every period. The returns differences among various rebalancing strategies are quite small in the long run. Instead of there being a benefit to rebalancing less often, it may just be safer that the frequency doesn’t matter. On the other hand, given the potential cost of rebalancing from taxes, commissions, and bid/ask spreads perhaps lowering the frequency doesn’t hurt. I think the most important thing to note is that in every test case above, the rebalancing was done on a strict schedule and without emotion. The problem you are really trying to avoid is being afraid buy whatever has been getting crushed and selling what has been doing awesome. There’s that behavioral/emotional component again. As for me, I try to check my portfolio once a quarter, but rebalance no more than once a year. An annual frequency is as easy to remember as your birthday, it’s not too often and not too seldom, lots of smart people are proponents, and it gives me the opportunity to do tax-loss harvesting. I use tolerance bands such that if my major asset classes are off by more than 5%, then I will rebalance. Otherwise, I “rebalance lite” year-round using any new money to buy underweight asset classes.